Don’t just think of a deck as an accessory that sits on the back or side of your home; think of it as an extension of your living space. Don’t just think of a deck as an accessory that sits on the back or side of your home; think of it as an extension of your living space. With that in mind, you’ll be able to create an outdoor living space that will increase the value and look of your home. Follow these five tips to achieve the deck of your dreams. Consider how your deck will be used. Will you use it to entertain family and guests or would you like to create a private oasis just for you and your spouse? Are you trying to maximize a gorgeous view around your home or create a private space that limits the snooping of the rest of your neighborhood? Having the answers to these questions will direct your design. Examine the size of your property and consider what size the deck should be, to enhance the overall look and feel of your landscape. Also, factor in how many people would be out on your deck at any given time. Do you need to accommodate a grill or built-in seating? It’s a good rule to remember that the deck should only take up about 20 percent of the size of your home to create visual balance and the right amount of curb appeal. Your deck is an extension of your home; the only difference is that it serves as an outdoor living area. Designing the layout of your deck as if it is the same as any other room in your home will help guide your choices in terms of arrangement, furnishings, and color choices. 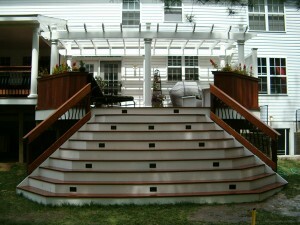 Another great way to think of your deck is to see it as a gateway from your home to the rest of your landscape. From this viewpoint, you’ll be able to design your deck around a specific theme that fits the aesthetic of your home and the natural colors and elements of your landscape, including your garden or pool. Invest in quality materials that will give you long-lasting performance. Once you build your deck, it will undoubtedly become a major part of your quality of life at home. High-quality materials will ensure that you’ll get the most use out of this space for many years to come.